Few minutes back the Untethered Jailbreak for iOS 5.0.1 just debutted. 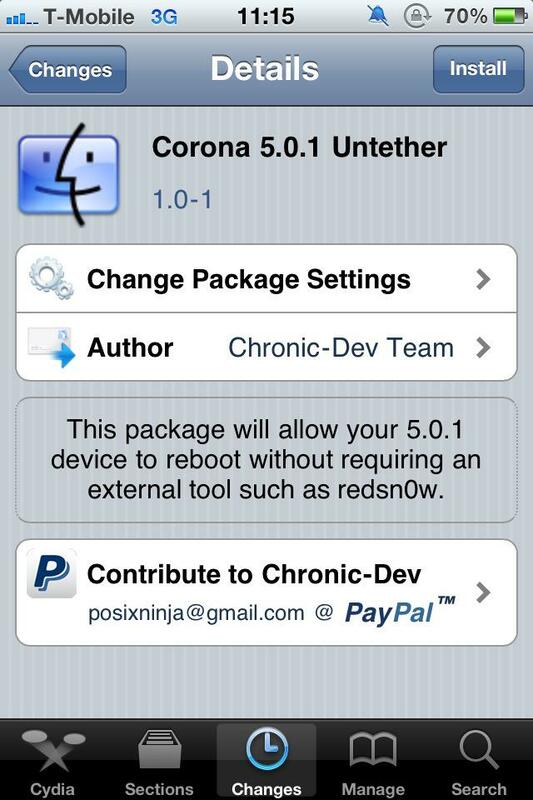 Many of you are downloading the new version of Redsn0w in order to Jailbreak Untethered on iOS 5.0.1. Many of you would be Tethered Jailbroken on your iDevice. Due to the heavy load on the website, you people cannot download the new update of Redsn0w. Some of you might be out for some work and cannot have access to your computer/MAC. you would be willing to do this Jailbreak to be on safe side and only got WiFi so far. 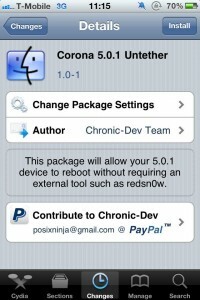 So if you got WIFI only and are Tethered Jailbroken on IOS 5.0.1, So you can open up Cydia and download Corona 5.0.1, the Tweak released by The Chronic-Dev Team to Untetehred Jailbreak on iOS 5.0.1. Simply open up Cydia and download this Tweak.Once you ahve downloaded this Tweak, You will be prompted to Reboot, Do that and once done. You will be Untethered. Now you will have Untethered Jailbreak on iOS 5.0.1 without any tool.